Cozy, Comfortable and Well Maintained Condo! Nicely Upgraded Condo has a Simple, Functional and Appealing Layout with a Small Kitchen overlooking an Open Concept Living/Dining area with a Kiva-Style Fireplace. Glass Sliders open out to a Patio with a sitting area where you can enjoy Golf Course and Red Rock Views. Both Bedrooms have their own Bathrooms making it an ideal set-up for Condo-Sharing. Condo is well appointed and attractively furnished. Wild Turkey is right in the heart of the Village of Oak Creek where Guests have access to Galleries, Outlet Stores, Golf Options, Restaurants and Hiking. This Modestly Priced Condo is a Great Value. 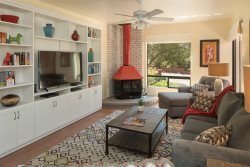 It has everything you need for an Enjoyable Stay in Sedona! Gina was terrific, very helpful and friendly. The maintenance men were very professional and efficient. We are staying with you again next year in a different unit. We love the location and convenience. I had an opportunity to view the unit, #11. We did notice an ant problem that hopefully will be resolved by next year. See you next year! I was happy that Paige helped me finding something in the midst of high season. any questions that I asked, were answered promptly ...very friendly and professional. lovely place and the weather was great. Agent was a joy to work with and was very helpful in finding a vacation rental for us for the winter of 2018.
the location was good, the condo is spacious and there is lots of dinnerware, glassware and cutlery. The leather couches are average not excellent.